Gosh, where in the world is the time going??? I can't believe that the Sat after next, Han will turn twelve and then the Sat after that is Christmas! Two weeks, people!! Before I get to the features from last week's links, I wanted to share with you some of my favorite things from stuff I bought this week. There's a little shop down the street from my house that has a lot of awesome stuff. There's a good mix of antique, vintage and new there and I always feel like I'm on a treasure hunt when I go in. It'd been awhile since I'd last gone and so I decided to stop in today and see if there was anything that tickled my fancy. There was! I paid quite a bit more for this than I normally do for the things I resell, but I think it was worth it, even if it doesn't sell. Next up were these awesome frames and wall hangings that I got from Good Will for $5.50! I'm in the middle of a master bedroom makeover and I'm still trying to decide if I want to paint all of these and hang them in a group somewhere in there. 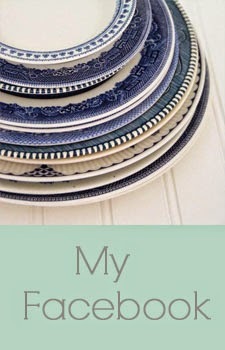 For a few years now I've been collecting milk glass whenever I find it. For the most part, I usually only find bud vases. I have a few pieces that are a little more unique, but I've still not found anything really all that great up until this week. I found this little gem at Good Will for $1.50. 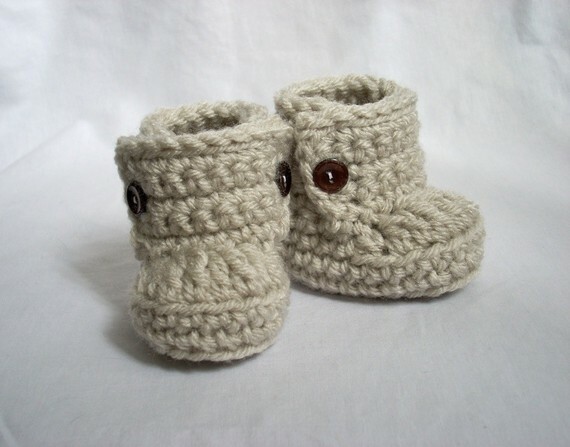 Next up are these totally adorable crocheted baby shoes and booties that I got for my niece, Ava. Aren't those the cutest??? 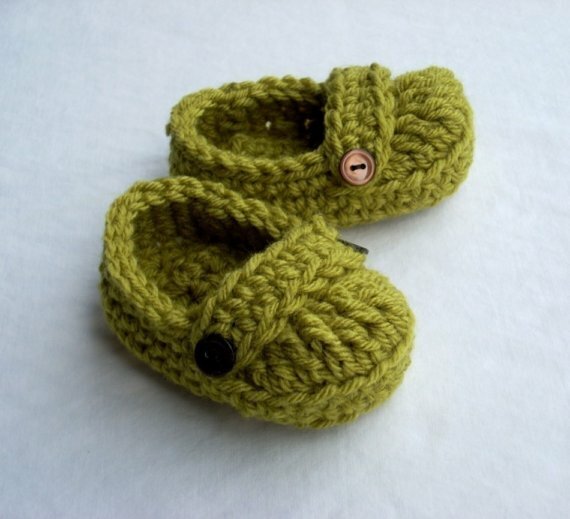 They from the Etsy shop, handmadebabylove. She's got plenty to choose from so head on over and take a peek. Now on to the two features from last week. Beautiful Christmas mantels like this one from Restoration House make me wish I had a fireplace. This is just so pretty and really, it could be used all winter. 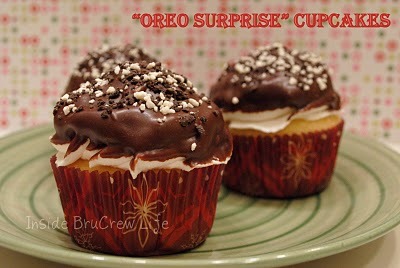 Next up are the delish-looking "Oreo Surprise" Cupcakes made by Jocelyn over at Inside BruCrew Life. 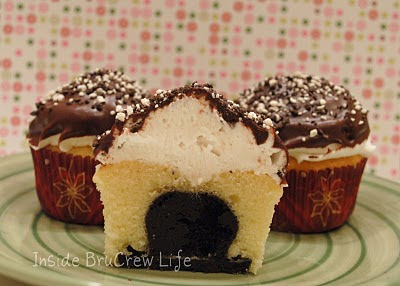 A freaking cupcake with an Oreo truffle inside!! Oh my! If you've not ever had an Oreo Truffle, you don't know what you're missing, and I imagine that I don't know what I'm missing having never had these cupcakes. Ooooh, I'm so hungry right now! Thanks to everyone who linked up last week! If you were featured, please feel free to grab a button. OK, it's your turn. 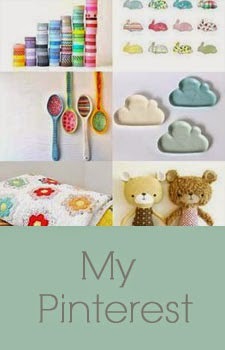 What are some of your favorite things? There's really only one. Please, please, please link back to the party so that others can join in. Also, it'd be really nice of you if you could visit a few of the other linkups and leave a nice comment. Thanks for hosting! 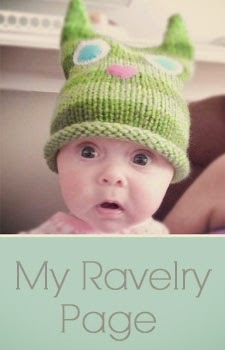 I love checking out all the creative posts.